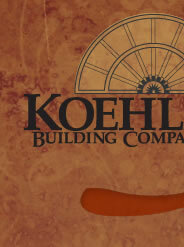 Koehler Building Company is a custom new home builder in the Johnson County Kansas, Overland Park, Leawood, Olathe, Mission, Lenexa, Lees Summit and Kansas City Metro areas. With emphasis on quality construction and outstanding architectural design, Koehler Building Company has custom new homes available in Overland Park, KS and the surrounding Johnson County areas. Contact us today for learn more about how we can build your custom dream home, remodeling, renovation or home additions project today!